See your dentist as soon as possible about your toothache if, you have a toothache that lasts longer than 1 or 2 days, your toothache is severe; you have a fever, earache, or pain upon opening your mouth wide. Proper identification and treatment of dental infections is important to prevent its spread to other parts of the face and skull and possibly even to the bloodstream. To treat your toothache, your dentist will first obtain your medical history and conduct a physical exam. He or she will ask you questions about the pain, such as when the pain started, how severe it is, where the pain is located, what makes the pain worse, and what makes it better. Your dentist will examine your mouth, teeth, gums, jaws, tongue, throat, sinuses, ears, nose, and neck. An x-ray will be taken as well as other tests, depending on what your dentist suspects is causing your toothache. The sooner you take care of the toothache the better chances you have of keeping your tooth. 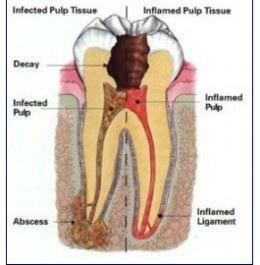 If you wait to long the tooth may become abscess, which will ultimately result in an extraction. If you are experencing any pain please call us at 251-550-7770!